clear that for us to see true transformation in the lives of the children we had to have some influence in their homes. 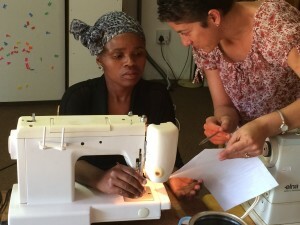 Our goal is to teach sewing skills to parents from the preschool that we manage. After an initial training period, our desire is to create quality South African products and sell them locally and internationally. By investing in the lives of these parents and teaching them a practical skill, we are empowering them and providing an opportunity to better care for their children. Another exciting aspect of this project is that local South Africans are getting behind us and want to partner with us to make a difference in their community. A real good friend of ours, Minette Bell, has volunteered to manage the day-to-day training of Red Thread. Minette is a local business woman in Potchefstroom and a former runner for South Africa’s National Team. She can also sew exceptionally well!Currently, we are training two mothers, Daphne and Mieta, on a weekly basis. They meet three times a week and they start off each day with prayer and a bible study. Minette has been teaching them the basics of sewing, they started out learning about the machine they would be working with, sewing lines on paper, and learning needle work. In the past couple of months, Daphne and Mieta have progressed very quickly. They even made their first bag a couple of weeks ago. They were both so excited!